Manjushri is the embodiment of great wisdom of highest Enlightenment. 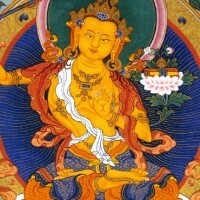 According to the elements he can appear in all kind of colours like blue or green but the most popular forms are the orange and the white Manjushri. Sometimes, Manjushri is depicted riding on a lion, the king of the beasts, symbolizing that Manjushri teaches the Dharma without fear or favour, with pristine royalty. In his fierce form Manjushri can emanate in various wrathful forms, like Yamantaka. The Bodhisattva Manjushri appears to those who meditate on him. Even though we cannot see him, yet, he instills and stimulates us to develop wisdom to free ourselves from karmic bondages. For this reason, images of the Bodhisattva Manjushri can often be seen in meditation halls, libraries and scripture study rooms in monasteries. For children, a picture or icon of Manjushri in their bedroom/study room would have the effect of quicker and better understanding of their studies. His right hand holds a flaming sword, which represents the sharpness of prajna that cuts through the root cause of suffering and the net of wrong views which binds us to the three lower realms. The flame on the sword signifies the dispelling of the darkness of ignorance by the light of Wisdom. Manjushri’s left hand holds a magnificent blue lotus flower in full bloom, on which rests the Prajnaparamita Sutra (Great Wisdom Sutra). The lotus in full bloom represents the promise from Manjushri that we can rise from the mud of delusion and afflictive emotions if we follow the teachings of the Buddha. Then ultimately, through actualizing and meditating on the Great Wisdom Sutra, attain Full Enlightenment. In China, his holy mountain is Wu Tai San in the province of Shanxi in China. It is written in the sutras that Buddha predicted that Manjushri would reside in the mountain of Wu Ting. Thus the people of China regard this mountain as the abode of Manjushri and the Chinese have built many temples there for the worship of Lord Manjushri.